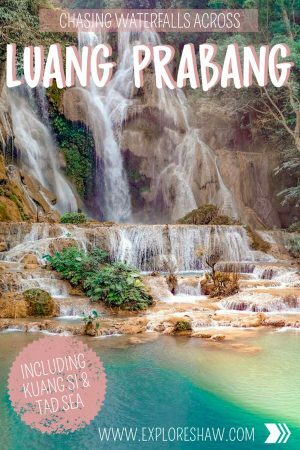 One of the major draw cards of Luang Prabang is how close it is to some of Laos most beautiful natural attractions. 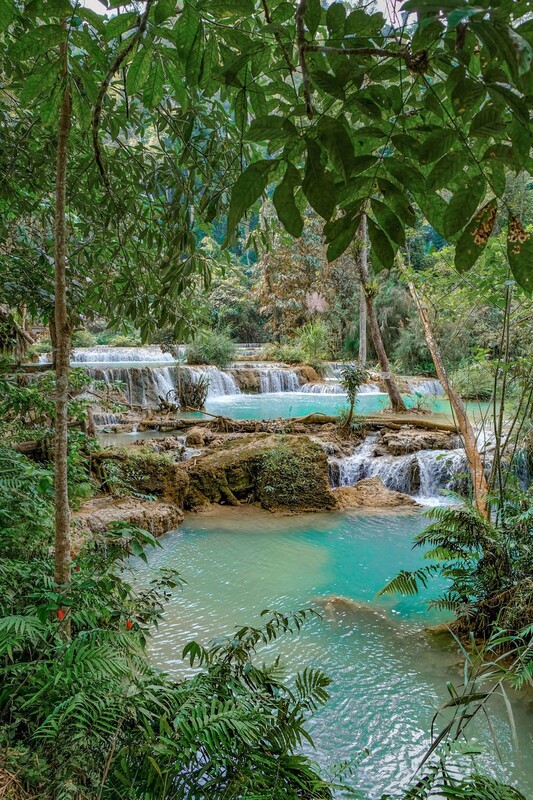 Two of Southeast Asia’s most beautiful waterfalls are only a short tuk tuk ride away from the centre of town – Kuang Si and Tad Sea Waterfalls. 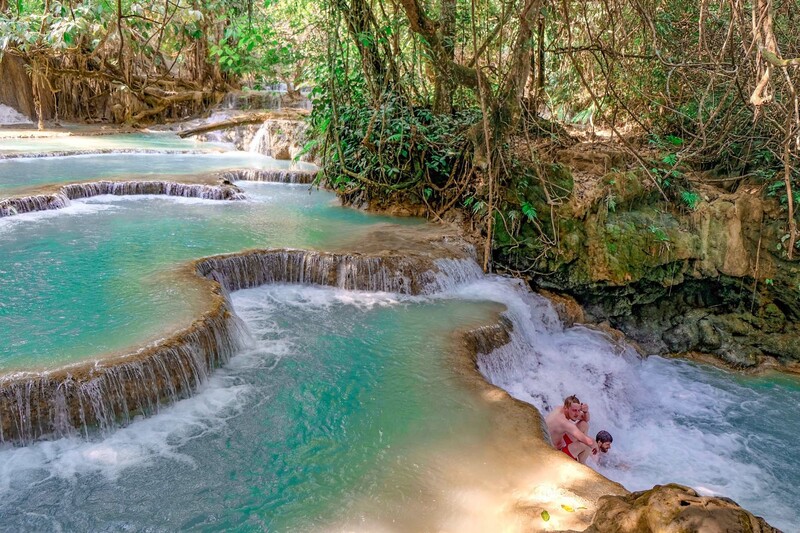 The only difficult thing about these epic waterfalls, is that they are in two different directions from the town centre of Luang Prabang, making them not the easiest places to visit. The best idea is to dedicate a whole day to exploring the two waterfalls, so you don’t feel too rushed or hectic. Which is exactly what we did. 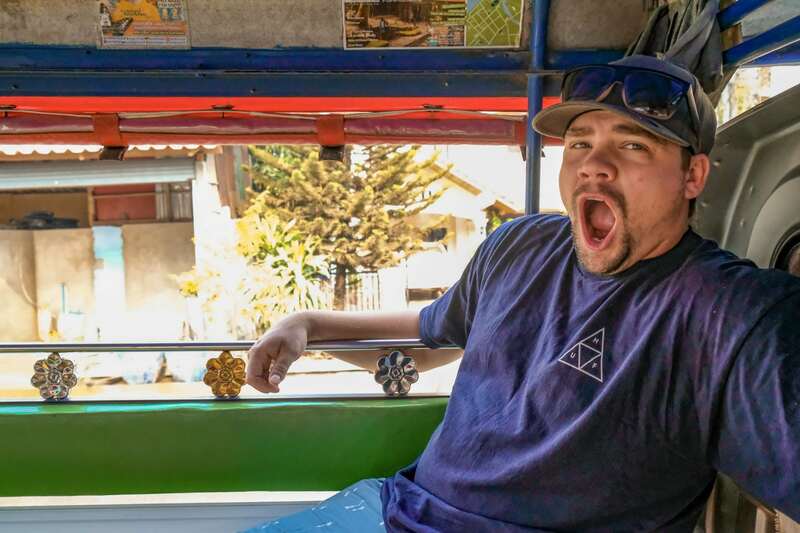 We woke up early on our first day in Laos (as you can see by Thom’s monster yawn above), and were lucky enough to find a tuk tuk waiting out the front of our hotel. After a little bit of negotiating we hired the tuk tuk for the full day to visit both Kuang Si and Tad Sea Waterfalls, which cost us 400,000kip. 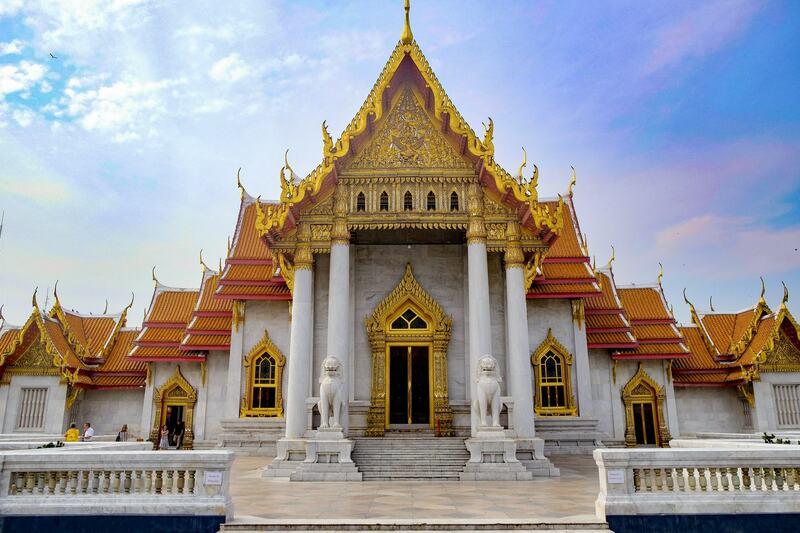 Although there are some cheaper options, including a shared tuk tuk or local mini-bus, hiring a private tuk tuk meant we would be able to take our time and experience the falls and the day at a slower and more relaxed pace. We actually had our driver for 9-10 hours in the end. 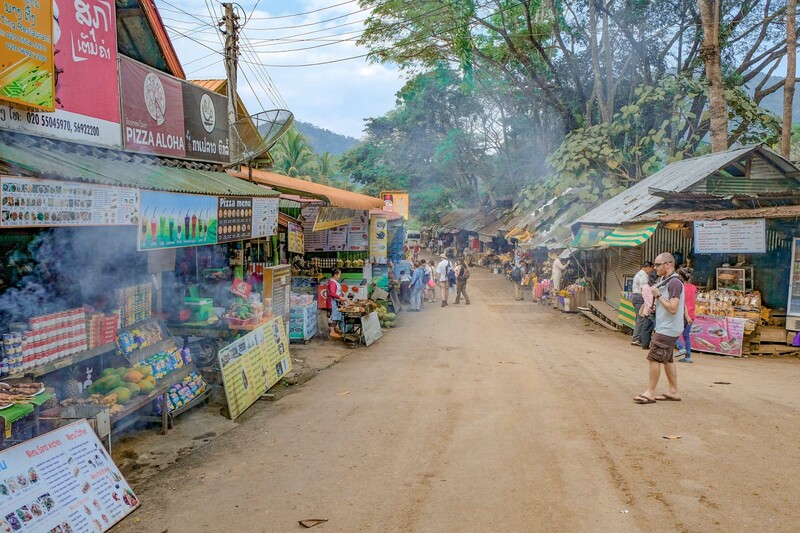 In no time at all we were on our way out for a day of waterfall hopping around Luang Prabang. 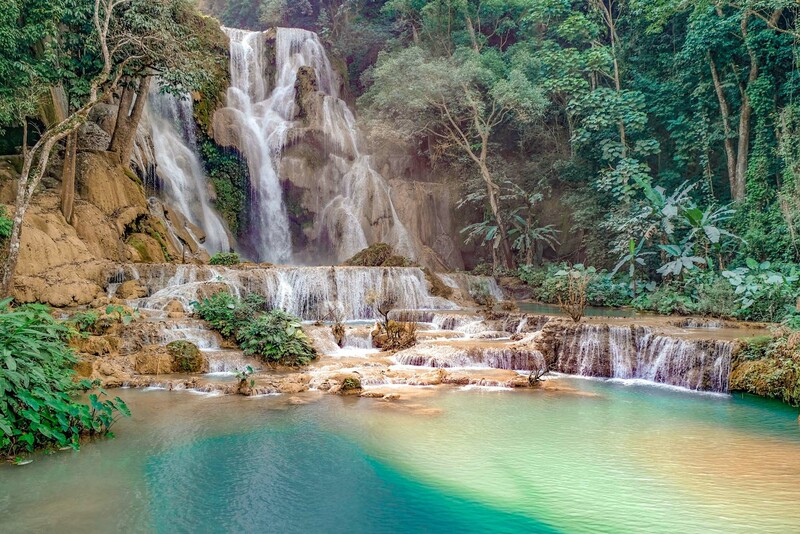 The biggest waterfall around Luang Prabang is Kuang Si falls. This epic turquoise blue waterfall has three tiers, cascading towards a 50-metre drop into some truly beautiful crystal clear swimming pools. These pools are the major highlight of the waterfall, and are very popular swimming holes for both tourists and locals, attracting hundreds of visitors each day. Each of the little swimming holes also have their own waterfalls, some of them are up to 5-metres tall. If you’re planning on going swimming, get ready – the water is incredibly cold, as the jungle surrounding the falls pools provides constant shade, cooling the water down during the peak heat of the summer days. But be super careful when you’re getting into and out of the pools – the rocks and concrete paths along the edge of the waterfall can be extremely slippery and dangerous. 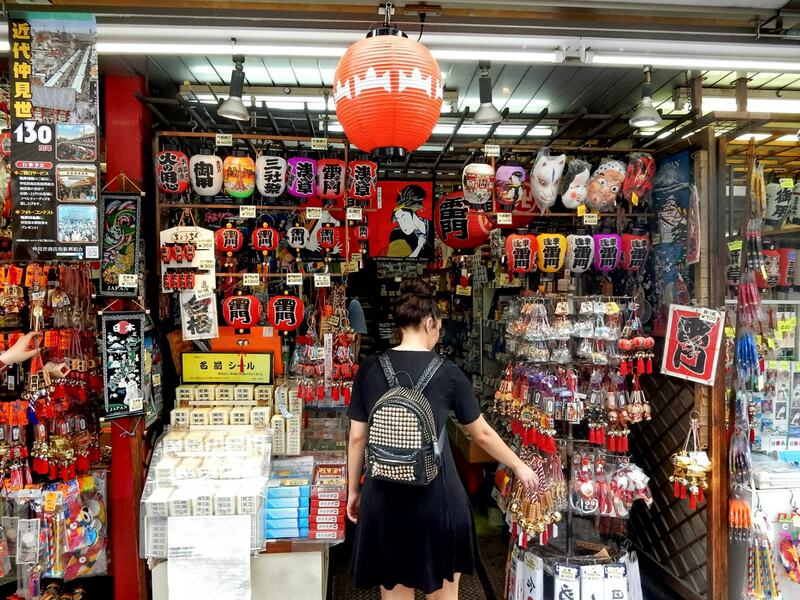 We unfortunately saw a German tourist take a major fall and smash his head on the ground – it looked so painful. Walk very slowly and make sure to pay attention to what people are doing around you. If the humidity isn’t too high and you’re in the mood for a big hike, a walking trail will take you right to the top of the biggest waterfall, where you can experience an epic view over the whole nature park. At the top of the falls you will even find some natural infinity pools, offering less crowds and beautiful views as you take a dip to escape the heat. It’s a good idea to wear appropriate footwear if you’re planning on doing the hike, as this trail can also become very slippery and is definitely not recommended for children. 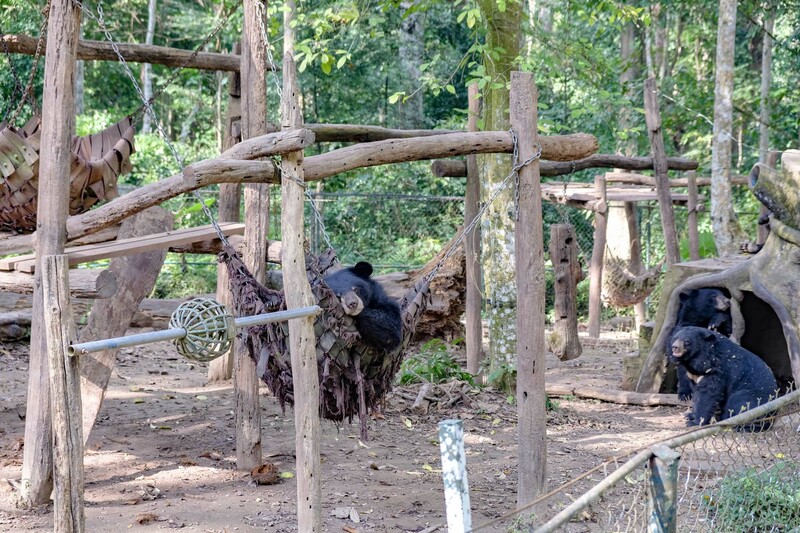 Just inside the entry gates of Kuang Si you will find the Black Bear Rescue Centre. The bears in this centre have been recused from poachers and illegal wildlife trade, and re-homed to live in safety at the rescue centre. You can watch these cute little bears from the elevated viewing platform that runs alongside the enclosure as they happily play together, swing on tire swings and roll around in the sunshine. Admission to the Black Bear Rescue Centre is included in your ticket to Kuang Si falls, but you can buy merchandise and t-shirts inside if you would like. The rescue centre is supported by the Free The Bears Foundation who work across all of Southeast Asia to protect the Asian bear population. 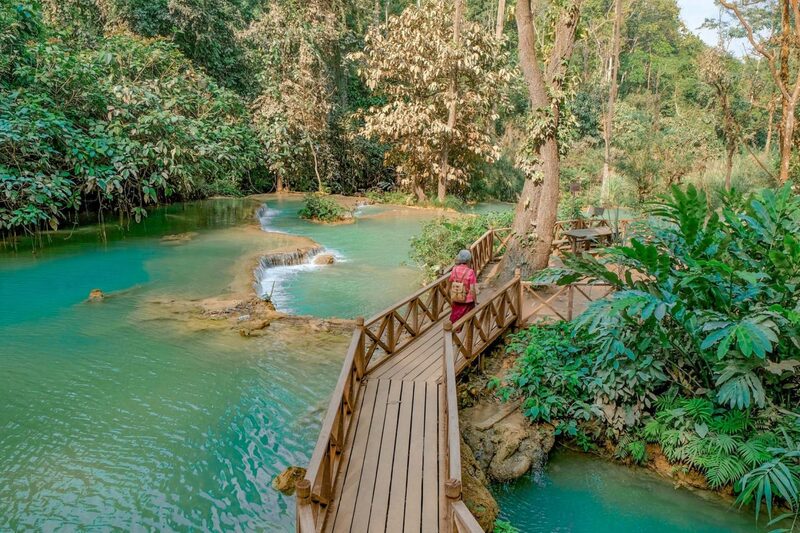 Kuang Si Waterfall is about 29km south of Luang Prabang. The easiest way to get there is by hiring a tuk tuk for half the day to drive you down there. 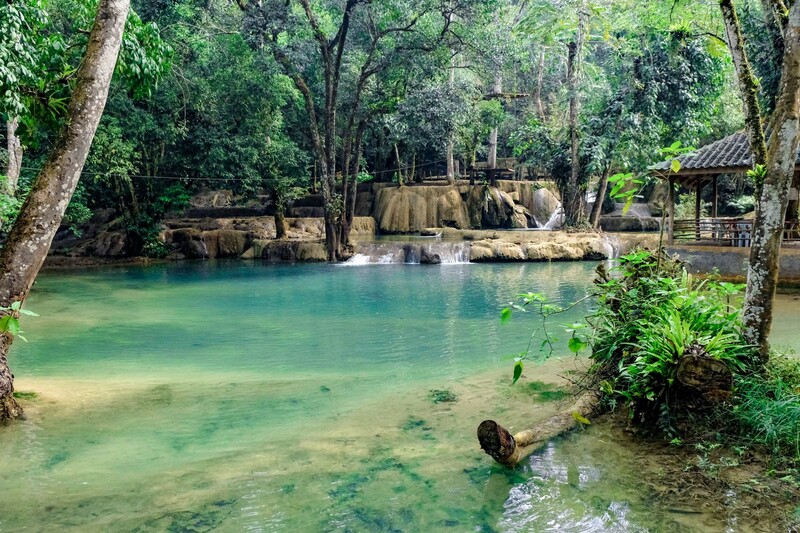 A half day tour to just Kuang Si falls costs about 250,000kip and takes about 45 minutes to an hour to get there. Alternatively, if you wanted to make your own way down to the falls, you can hire a motorcycle and ride down there. The roads leading to the falls can be rocky and difficult to navigate. 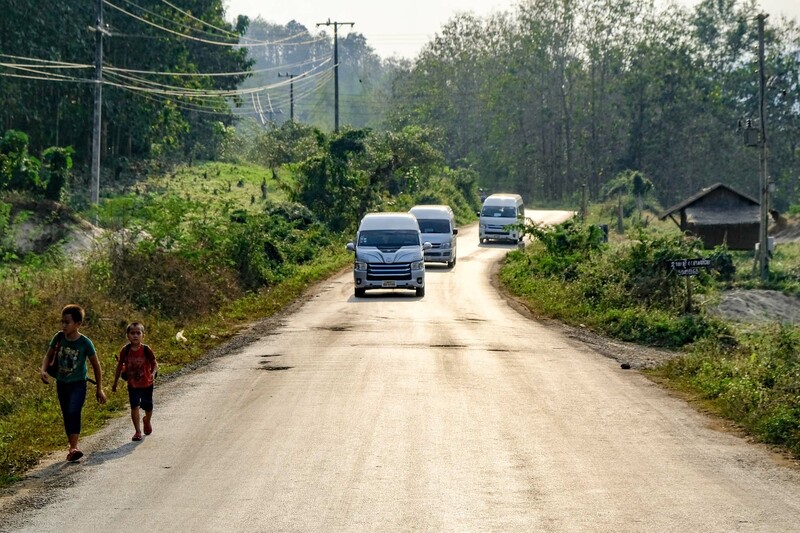 For a cheaper option you can also jump on one of the mini-buses departing from the Naluang Mini Bus station. 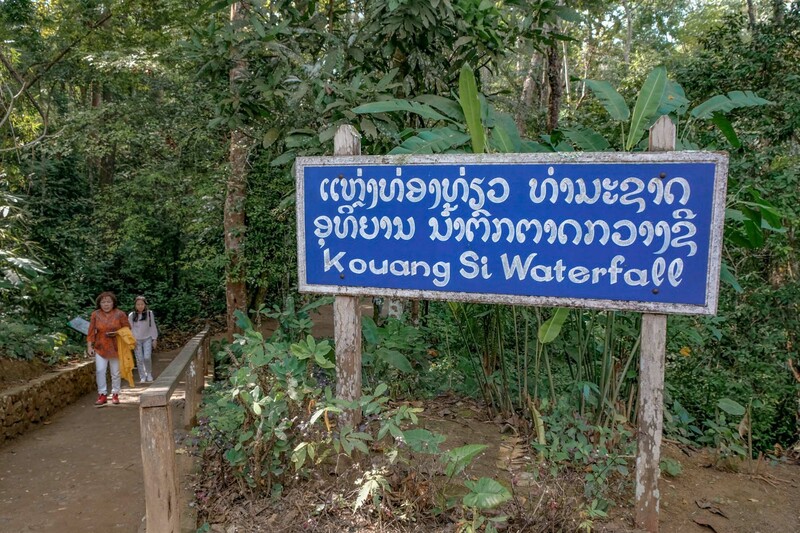 A ticket to Kuang Si falls costs 20,000kip per person (about $3AUD) for a one day visit and also includes admission to the Black Bear Rescue Centre. A whole day of hopping between waterfalls is sure to make you hungry, so take some time to grab some food in between the falls. 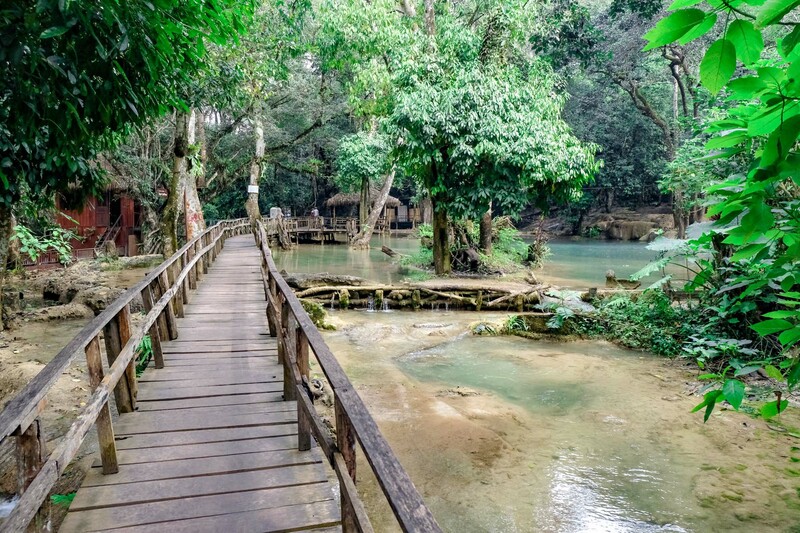 Out the front of Kuang Si Waterfall you will find all kinds of local road side restaurants and BBQs, offering traditional Laos food and some Western options. It’s a great place to stop for a quick bite to eat before you hop over to the next waterfall. 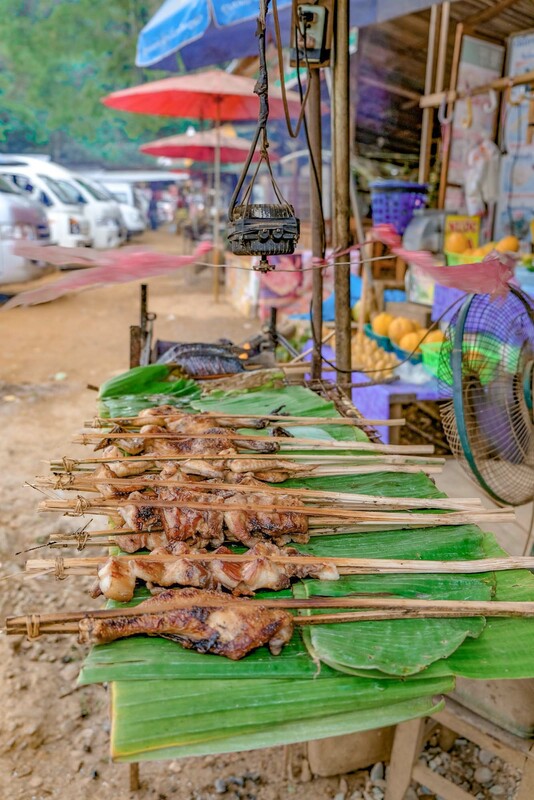 Try out some Laos dishes that you haven’t tried before, you will be so glad that you did. Looking for something a little more off the beaten track? Tad Sea Waterfall is a little lesser known than Kuang Si, so you can often find you have much of the falls all to yourself, especially if you’re visiting in the early morning. 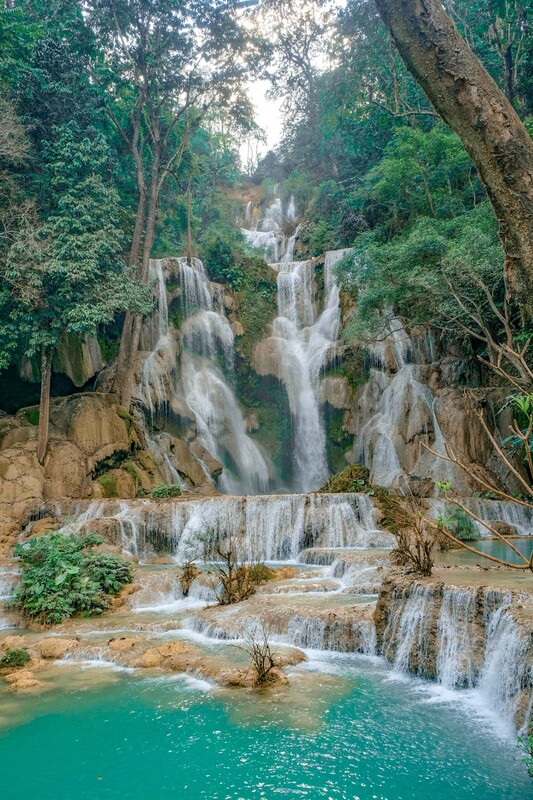 Although Tad Sea aren’t as high or dramatic as Kuang Si falls, there are many more streams of water, which just look epic and sound absolutely thunderous if you’re visiting to the wet and rainy season. The falls tumble over stunning limestone pool walls and cascade down multiple levels that are perfect for swimming. The biggest draw card of Tad Sea is definitely it’s elephant residents. The elephants living at Tad Sea love the water and making friends with visitors. At the base of the falls you can buy bananas, coconuts and bamboo shoots to feed to these greedy elephants. 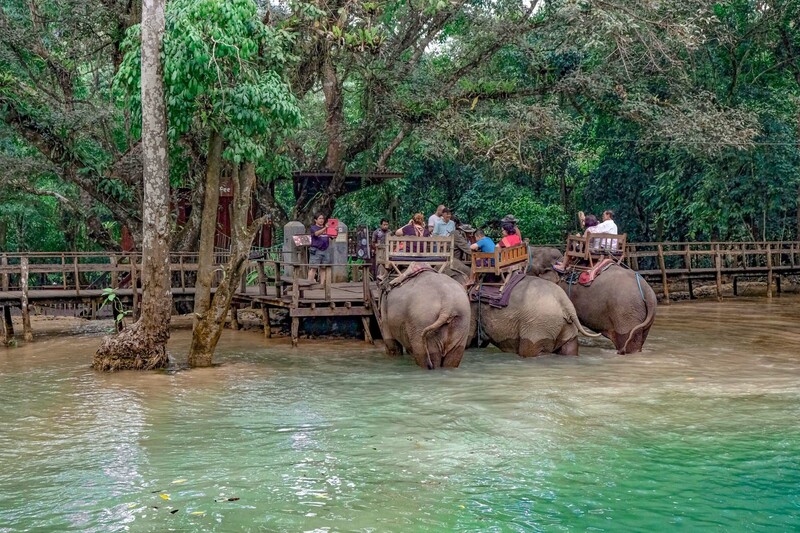 Although we try to avoid animal tourism and do not promote riding the elephants at Tad Sea falls, one thing they did offer that looked like fun was swimming with the elephants. It was a bit too cold when we visited, but if you choose to swim with the elephants you can walk them into one of the more accessible and shallow pools and splash around with them as they enjoy the water. The only thing I would consider though, is that the elephants do not have any issues doing giant poops while they are in the water, so watch out if you’re swimming with them!! The good thing about swimming with the elephants is that there is no riding, no pressure on the elephants back, no harnesses, saddles, seats on their backs, etc. 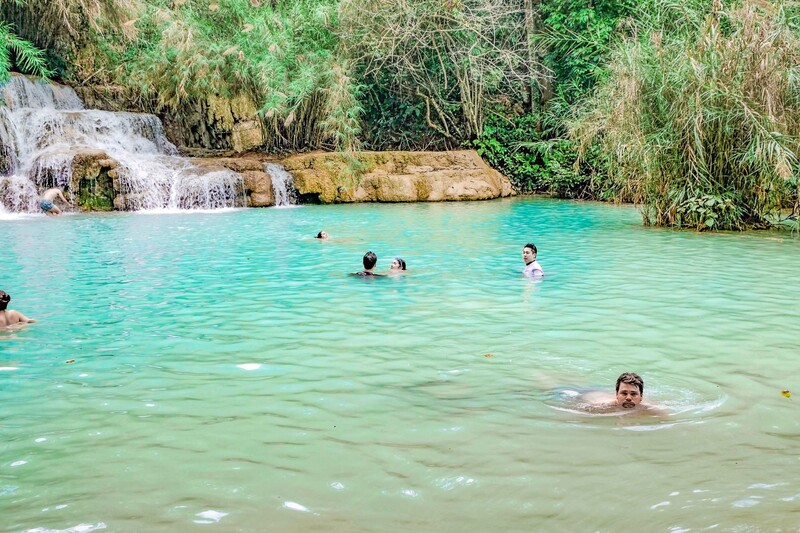 Tad Sea is very popular with locals, especially those looking to avoid the large crowds that flock to Kuang Si falls. Because this is more of a local pool it is a good idea to dress a little more modestly like them, to avoid making them uncomfortable. This is probably a day where a one piece should be chosen over those brazilian bottoms. The best time to experience Tad Sea falls is between August and November – the rainy season, when the water is flowing and really cascading over the swimming hole walls. Outside of these months, the falls are actually very dry so they might not be as impressive as you would expect – but they are still beautiful! The only way to access Tad Sea is by boat, making it even more of a unique experience as the boats take you deeper into nature than you can access on your own. 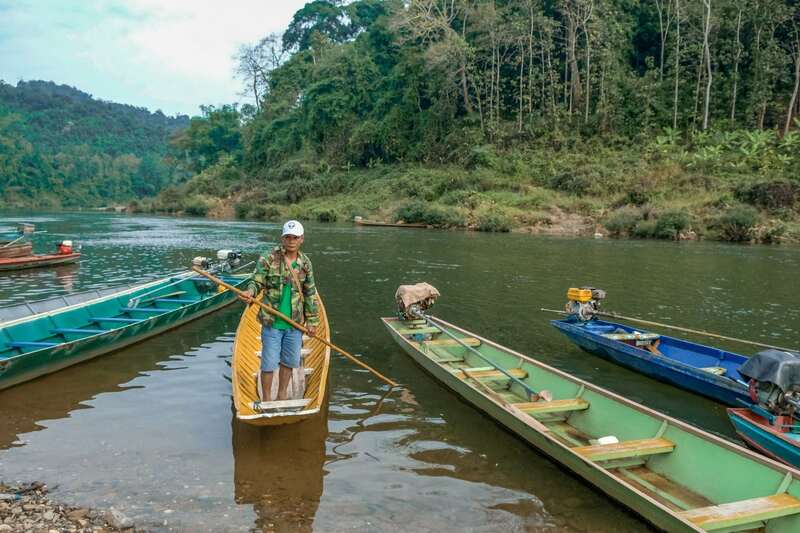 The boat ride takes about 10 minutes from the bank of the Nam Khan to the entrance of Tad Sea falls. The boat ride costs 10,000kip for a return trip. 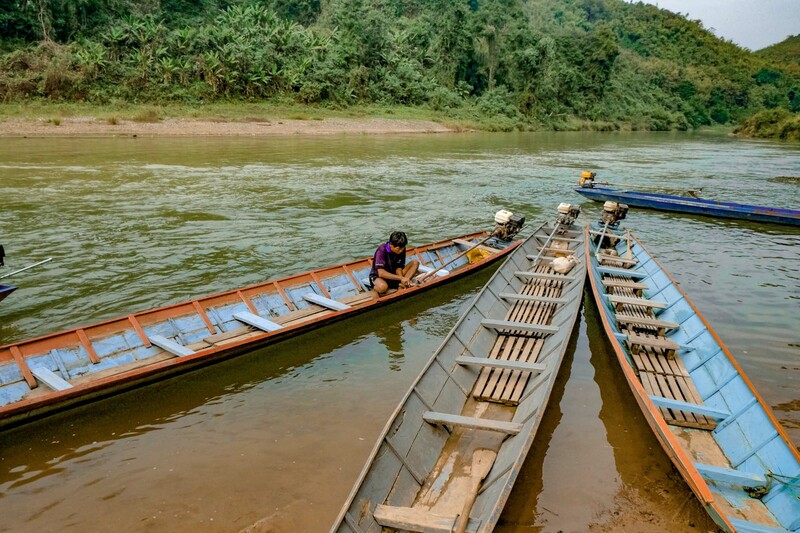 Tad Sea is located about 20 kilometre away from Luang Prabang, which takes about 45 minutes by tuk tuk. Entry to Tad Sea falls costs just 15,000kip per person, which is only $2 AUD. If you would like to participate in any of the elephant activities, including buying food to feed them or going swimming with them, these charges are extra and not included in the admission price. 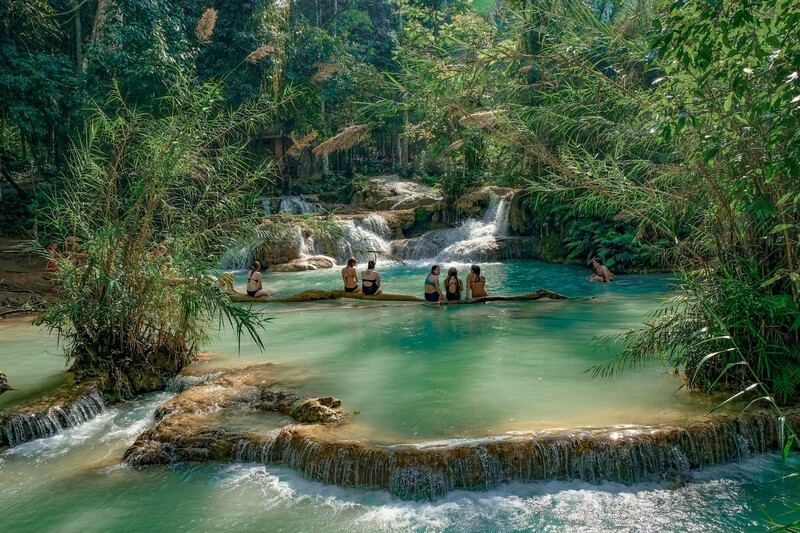 So Which Waterfall Should You Visit in Luang Prabang? If you don’t have the time to explore both of the waterfalls, then your decision might come down to what time of the year you visit. If you’re visiting during the rainy season, between August and November, you will get to see Tad Sea at it’s peak, with cascades of water putting on quite a show. If you’re visiting at any other time of the year (like we did in January), the falls aren’t really flowing. 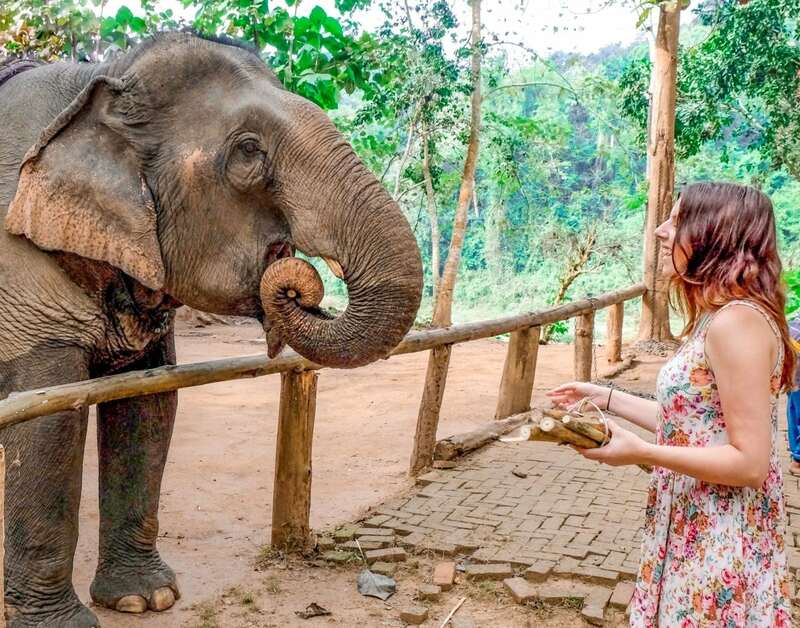 But they are still fun to visit, especially if you want to feed some elephants some bamboo shoots and coconuts. Kuang Si is extraordinary at any time of the year, so to be honest, it would be my first pick all year round. There are many more pools to explore and the main waterfall is just so beautiful that it shouldn’t be missed. 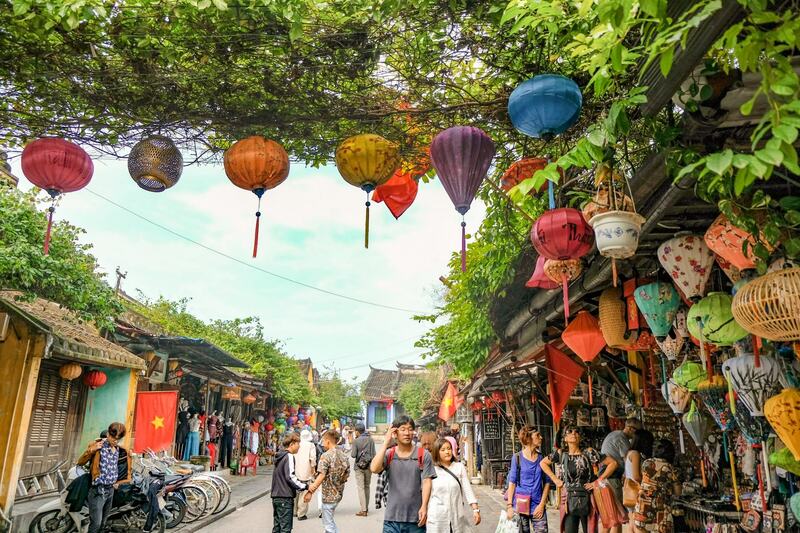 The only downside of Kuang Si is that it is much more popular and well known, so expect larger crowds and not much space to yourself. As is often the case though, sometimes it’s worth dealing with the crowds to experience this amazing waterfall. These waterfalls and the nature around them is so gorgeous! Really awesome photos! Honestly this is always a debatable question! We had a great time feeding the elephants at Tad Sea and we did not ride them, but they do offer rides which are always thought to be unethical. As always it’s a personal choice about visiting places that offer rides, even if you don’t choose to participate yourself. 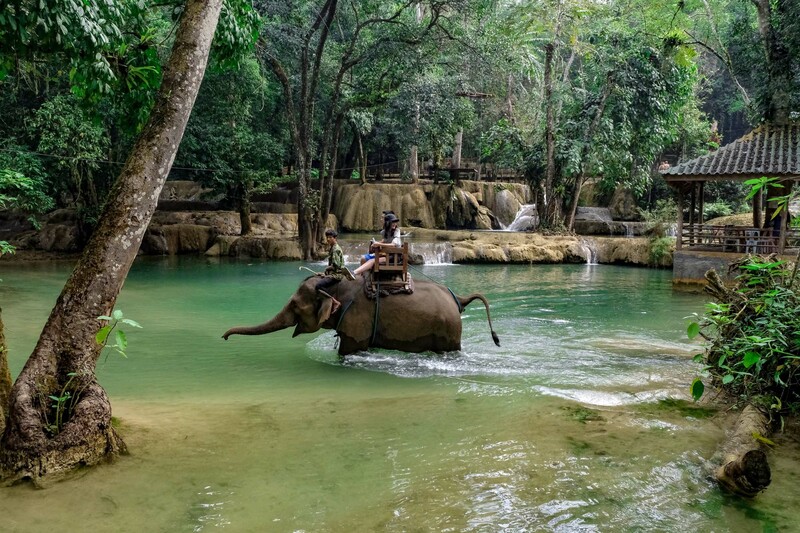 But if you prefer to avoid it all together, Kuang Si falls has no elephants ?